As you may know, I lost our Loki this summer. I am lost without him and Frisco remains depressed. 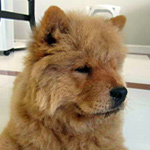 I found an eight year old chow needing a home. He is a male and I am hoping this might be a good fit for Frisco. 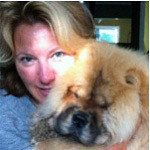 Is adopting a chow this age a good idea? How do you think Frisco might react? All you can do is try it out but personally I would look for a female to help your chances of success. Do it!!! We foster chows and everyone has turned into perfect family members in their new homes. 8 years old is nearing senior age. You have to be ready for the medical costs he/she can rack up from visits to the vet. Also, have him/her visit your other dog or vice versa and see how they bond or not before you take the plunge. Frisco and the potential rescue need to meet a few times to see if they will get along. When Nahkohe passed and we got a GSD puppy, Shiloh did everything to stay away from the pup. A year later we rescued an ASD/Chow mix. We did take a chance with adopting without the ASD meeting Shiloh. He was posted as great with other dogs and got along with our GSD when we showed up at the foster's (we couldn't bring Shiloh). When we brought him home, Shiloh came in took one look at him and went out in the backyard for an hour. She came back in - they sniffed and that was it - no issues. It really depends on the synergy between Frisco and the rescue. I am part of a local dog/cat rescue. The policy is that potential adopters visit with their dog to make sure there won't be an issue. It's really stressful for a dog to be adopted and then returned - so sad for them. Great that you are looking to rescue! What??? Old, ShenLung would disagree totally, at 9 yrs he is extremely healthy and can still beat FuShiLu to a fix, rabbit, etc., with little issue. Love, it makes a difference. Ski, update please? Even if the rescue you were considering didn't pan out, I appreciate everyone who rescues. I'm thinking I might sell my minnow tank as don't think am giving them the care they need. Have no idea how much should sell them for or if I should sell just the fish and everything else separately.